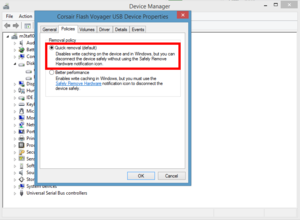 Windows warns you when USB drives may have corrupted data or weren’t ejected properly. So you go through the motions, scan the stupid drive, fix it, and everything’s fine. Then the next time you connect it to your PC, there’s that darn message again. So how do you fix this problem for good? Here are a few tips. A common reason for seeing the scan and fix error message is that your drive needs to be ejected from the system before yanking it out. Most of the time when you just yank a thumb drive out of a USB port nothing bad will come of it, since Windows allows you to do this by default. 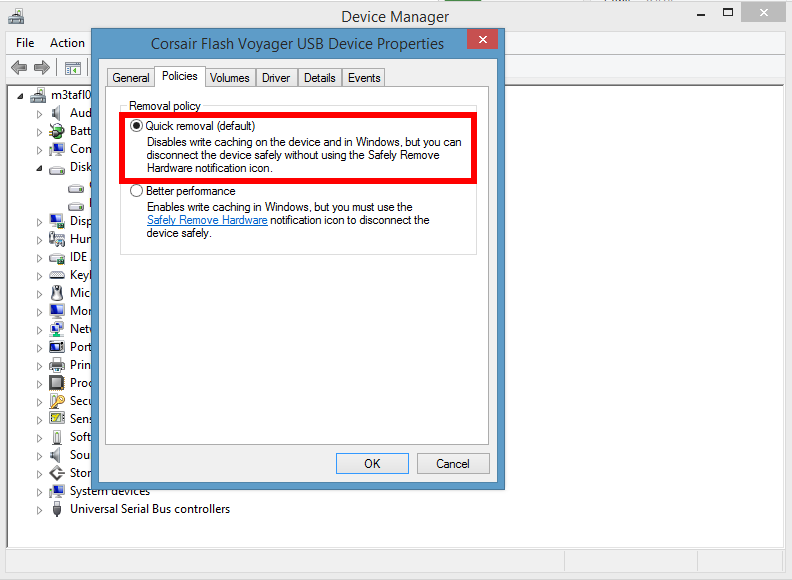 But there are some cases where Windows wants you to properly eject a USB drive from the system. Choose your USB drive from the list (in this case there’s only one). There are two standard ways to properly remove a thumb drive on Windows and you probably know both of them. Just to review, however, the easiest thing to do on Windows 8.1 is to click on the upward facing arrow in the lower-right corner of your taskbar. Then look for the USB icon with the green check mark, right-click it, and choose the drive you want to eject from the list of USB-connected drives. Next, wait for a “Safe to Remove Hardware” balloon to pop up from the taskbar and then pull out the USB drive. All clear, your drive can now be safely removed. Do that every time and the scan now message should stop appearing—after you allow Windows to scan and fix the drive one last time, that is. Ejecting drives properly goes for any other operating system you plug the drive into. For example, I often shuttle a USB drive between a Windows PC and a Linux-based Raspberry Pi hooked up to my TV in the living room. If I pull the USB drive out of the Raspberry Pi before ejecting it properly, Windows will also scream at me and ask to fix the drive even though the improper ejection occurred on a Linux-based system. If you can’t be bothered with going through the motions to properly remove a USB drive, another option is to make sure write caching is disabled for the drive, though we don't recommend doing it if you're handling critical data. Write caching is a feature that allows Windows to collect (cache) a bunch of write commands in memory and then save all the data to your USB drive in one big batch. Windows enables this option by default, as it protects against potential data loss in the event of a sudden power failure. With your USB drive plugged in, right-click the Start button in Windows 8.1 and choose Device Manager. Write caching is disabled by default in Windows, but you never know. 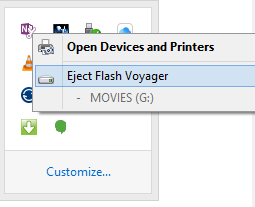 In the next window, click Disk drives, right-click the name of your USB drive, and choose Properties. Another window opens: Click the Policies tab, then click the Quick removal radio button, and finally select OK. Close the device manager window and you’re done. 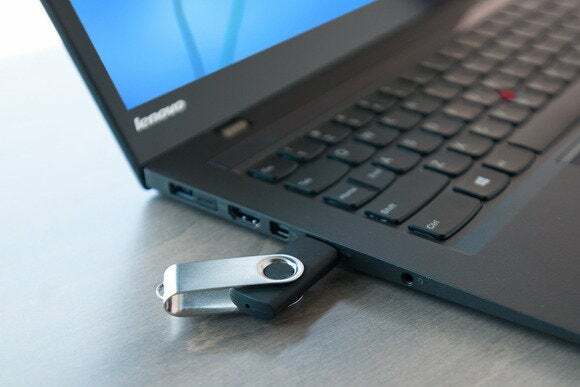 There’s still a small risk that data on a USB drive can become corrupted with write caching disabled, but it does allow you to just yank out the USB drive without ejecting it first.—at least in Windows. If you use the same drive on a non-Windows system you’ll still have to eject it properly or suffer the wrath of the Windows error message.